Frank McCourt’s $2 billion sale of the Dodgers to a consortium led by Mark Walter, Stan Kasten, and Magic Johnson should eventually prompt a big spending spike for a team that fell to middle-of-the-pack status in major league payroll and dead last in international spending over the past two years. It’s that second issue that’s more troubling: A once-proud farm system now ranks no. 24 in Baseball America’s Organizational Talent rankings, after getting neglected during McCourt’s final days of reckless debt accumulation. Not much power here. The Dodgers finished just 23rd in slugging average last year, despite Matt Kemp’s MVP-quality performance. Yet the team’s big offseason move was to re-sign Rivera after the 33-year-old outfielder hit just .258/.319/.382 between the Dodgers and Toronto in 2011. Since money was at a premium given the McCourt mess, why not just see what you’ve got in Jerry Sands and save $4.5 million for legal fees and 14 more swimming pools? Like Rivera, Sands probably won’t help a ton defensively. Unlike Rivera, there’s actually some upside here, given Sands is eight years younger and hit 35 homers across two minor league levels in 2010, and 29 more at hitter-friendly Albuquerque last year. Sands’s .158 spring batting average doesn’t prove much, and certainly doesn’t account for Rivera being re-signed months earlier. Even with a terribly flawed team, the Dodgers might not be that far away from contending in an NL West that lacks a dominant team. Settling for known, mediocre veterans when superior (and much cheaper) options might already exist on the roster is a weird way to run a ball club. Frank McCourt or no Frank McCourt. Not a bad group at all, actually. Kershaw we know about. 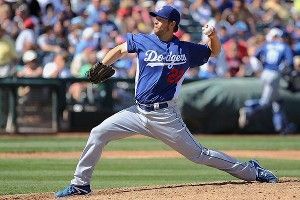 Lilly’s not cheap at $22.5 million over the next two years, but he’s an extreme flyball pitcher with a strikeout-to-walk rate consistently above 3-to-1, a workable combination at pitcher-friendly Dodger Stadium. Capuano’s also a 30-something lefty with home run issues and strong strikeout-to-walk rates, and the Dodgers got him for $10 million over two years. Chad Billingsley might be viewed as a bit of a disappointment given his first-round pedigree and high expectations, but he’s been an above-average pitcher in each of the past four seasons, averaging 32 starts a year and posting FIPs of 3.35, 3.82, 3.07, and 3.83. The bullpen might be a little weaker. Kenley Jansen is a star in waiting, posting a preposterous 16.1 strikeouts per 9 innings rate that isn’t at all out of line with the video game numbers he put up in the minors. The rest of the pen is laden with decent-but-not-great veterans like Matt Guerrier, Todd Coffey, and Jamey Wright, all capable of soaking up innings but none of them shutdown relievers by any stretch. Javy Guerra, the nominal closer to start the season, owns some workable peripherals, but he also owes some of his 21-save rookie season to an abnormally low 4.1 percent home run-to-flyball rate and .261 batting average on balls in play. Ironically, the optimal setup for many bullpens is to have your best reliever throw high-leverage situations in the seventh and eighth innings, and leave the often easy job of closing (ninth inning, up two or three, bases empty, even needing a single out counts as a save). That’s what the Dodgers have right now in Jansen and Guerra. Jansen. More of a fantasy pick than a real-life pick, since Jansen parlayed a mere 53⅔ innings last year into 1.5 Wins Above Replacement, an exceptionally high total for a relief pitcher with so little usage. There’s also the matter of Jansen having an ongoing heart ailment, and the whole better-to-use-your-best-guy-as-not-the-closer thing. But Jansen’s sky-high strikeout rates and recent memories of The Eric Gagne Experience will be too much for the Dodgers to resist. Jansen will be the new Game Over at Dodger Stadium, sooner rather than later. The Dodgers hang in the race thanks to weak competition, giving new ownership a chance to leverage their financial muscle into a big deadline deal or three. The feel-good, anybody-but-McCourt story gains steam down the stretch, and playoff baseball improbably returns to Chavez Ravine. Kemp and Kershaw are awesome, most everyone else isn’t, and the Dodgers finish below .500 for just the second time in seven years.